The third annual Everybody’s Formal, which is hosted by the Associated Student Body, is being sponsored primarily by Greek life organizations. ASB was still reaching out to potential sponsors the day before the formal. The official sponsors for the event listed on ASB’s Facebook page are College Panhellenic Council, Fraternal Leadership & Learning, Kappa Sigma fraternity, Ole Miss Men’s Basketball, Special Projects coordinator Linda Spargo, the Office of the Chancellor, the Division of Administration and Finance and the Division of Student Affairs. ASB President Elam Miller is a member of Ole Miss’ Delta Xi chapter of Kappa Sigma fraternity. Miller said ASB doesn’t have a list of everyone who was asked to be a sponsor and that the organization brought in other people to collect sponsorships who normally wouldn’t be helping find sponsors because ASB was “short of money” for the formal. Miller said he approached people in class and in passing to ask about sponsoring the event. Mullins is the president of Beta Theta Pi fraternity. The planning committee for Everybody’s Formal was led by initiative director Kelsea White. White, who is a member of Ole Miss Alpha Mu chapter of Kappa Delta sorority, appointed a team of associate directors that was made up of Danielle Foster, Georgia Summer and Sally Rychlak, all of whom are members of Ole Miss’ Alpha Delta chapter of Phi Mu sorority. White said this was her first year being a part of ASB and that she took on the position when Miller approached her in August. She said Miller wanted to create a different management structure for Everybody’s Formal, so there wasn’t a formal application process for the directors of the event. College Panhellenic Council President Ann Weston Sistrunk said Miller reached out in September to ask if the group would like to help sponsor the event and that “as a council who advocates for student experience and leadership on this campus,” the council agreed. Minutes from the latest ASB Executive Council meeting indicate that planning and acquiring sponsors for the formal happened last-minute. On Tuesday afternoon, two days before Everybody’s Formal, some presidents of Interfraternity Council fraternities and National Pan-Hellenic Council sororities said they had not been contacted by ASB with the option to sponsor the event. “No one contacted us about sponsoring it, but we did get a message to attend,” Delta Psi President Will Tribble said. Phi Kappa Tau President Jay Vaughn also said his fraternity chapter was not contacted about sponsoring the event on Tuesday. 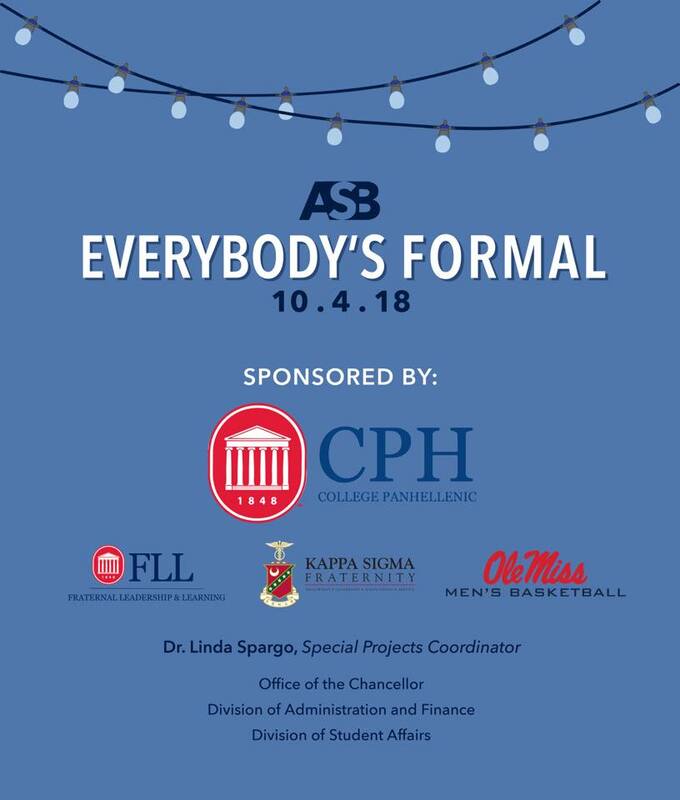 On Wednesday morning, ASB Executive assistant Barker Fowler emailed IFC, Panhellenic and NPHC chapters to offer them the opportunity to sponsor Everybody’s Formal. Fowler wrote that organization leaders would have to respond within an hour if they wanted their group’s name on the official event banner. “We were contacted (Wednesday) for the first time, and it said respond within an hour. And by the time I saw it, it was too late,” said Cellas Hayes, the president of the Ole Miss Eta Beta chapter of Phi Beta Sigma fraternity. President of the Ole Miss Lambda Sigma chapter of Delta Sigma Theta, Kaylyndzeyia Gray, also confirmed that her sorority received an email about sponsoring Everybody’s Formal and was given an hour-long deadline to respond on Wednesday.